Homily: Today's readings speak about fasting, about the penance we're called to, to draw closer to the Lord. God delights in contrite hearts, hearts of those who feel and know themselves as sinners. In the 1st reading, God rebukes hypocrites who fast but oppress their workers, doing penance but being unjust. The Lord calls us to a true fast, attentiveness to our neighbor. Don't take the bribe of vanity, of being seen; your good work is only for the Father. How do I fast, pray, give alms? How would I feel about a man who on the way home after a fine dinner out sees someone hungry, doesn’t look at him, and keeps going? March prayer intention: Many are being persecuted because of their Christian faith, forced to abandon their homes, their places of worship, their lands, their loved ones! Pray with me that they may be supported by the prayers and material help of the whole Church. Is 58:1-9a On your fast day you quarrel and carry out your own pursuits, but the fast I want is releasing those bound unjustly, freeing the oppressed, sharing your bread, sheltering the homeless, clothing the naked, and caring for your own. Then you'll have light, healing, and vindication, and God will answer you. Ps 51:3-6ab, 18-19 "A heart contrite and humbled, O God, you will not spurn." Have mercy on me. Creighton: We shouldn’t carry ourselves in a way that ensures everyone knows we're fasting, making a sacrifice, or serving others. We're challenged to make sacrifices in the service of others. 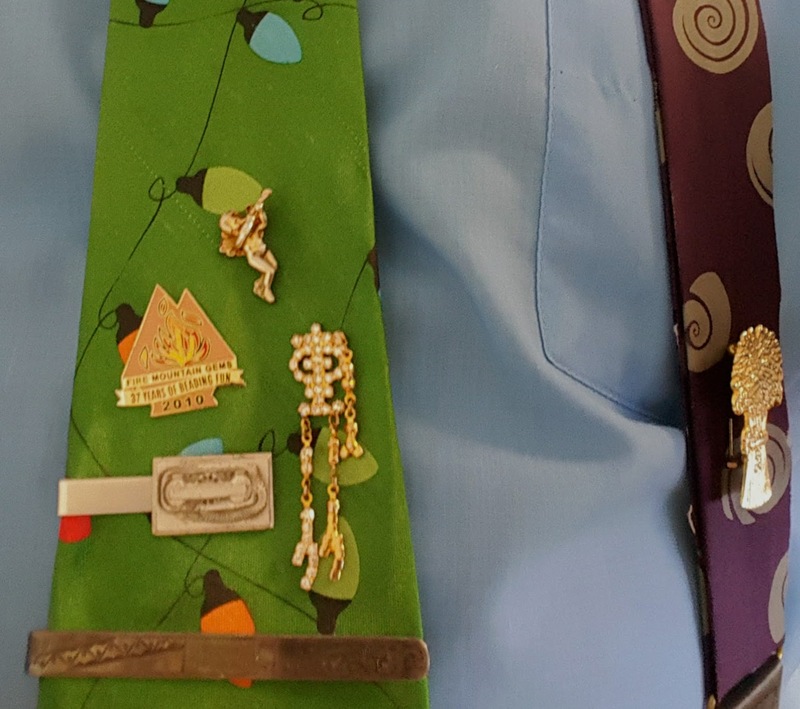 Our motivations are sometimes self-serving, to be seen as caring. We sacrifice and serve with quiet joy; when we recognize God's presence and gifts, we can share and serve out of gratitude. 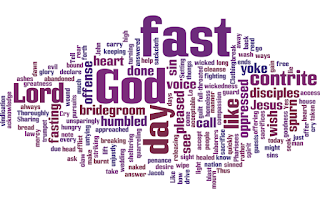 One Bread, One Body: "A whole-person fast": We fast so as to share Christ's sufferings; we're to care more about his broken body than our own hungry ones. 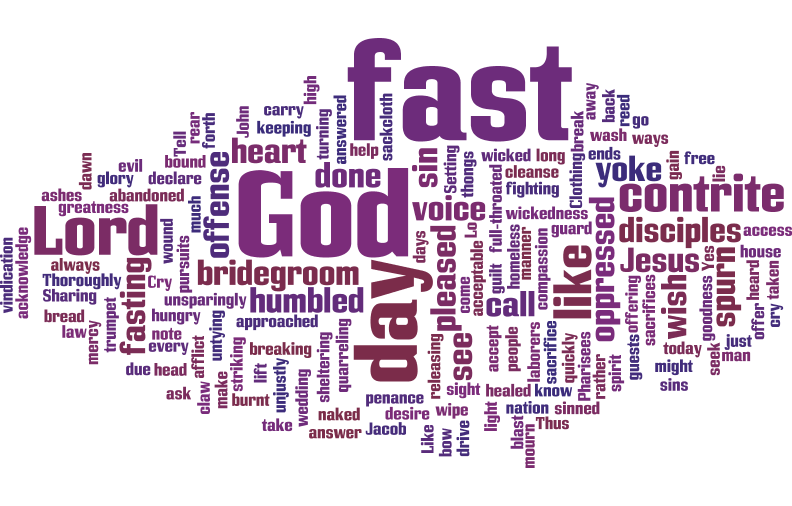 The Lord asks, "Did you fast for me or yourselves?" God wants fasting from humble, contrite people. May we fast with our whole self. We can offer a heart that mourns for prisoners, the hungry, homeless, naked, and suffering. Fast with eyes on Jesus and his word, ears open to obedience, your whole person; build up the body of Christ. Passionist: What keeps us from being present to Jesus and others? That's what we need to fast from. Fasting helps us find balance and grow in self-control. As we fast, pray, and give alms, may we draw closer to God and to others. Lord, guide me to the fast that will best help grow in faith. DailyScripture.net: "Fasting for God's kingdom": Hunger for God and fasting for his kingdom go hand in hand. The Lord's disciples must bear the cross of affliction and purification; there's a time for rejoicing in the Lord's presence and goodness and a time for seeking him with humility, fasting, and mourning for sin. May we allow the Holy Spirit to transform our life with God's power and grace. Fasting can be done to gain freedom from a bad habit, share in others' suffering, or grow in hunger for God and things of heaven. "Don't just abstain from meat. True fasting is refraining from vice. Shred your unjust contracts. Pardon your neighbors...." (Basil the Great).